Drivin' on in our 23rd Year in 2019! ​ RADIO SHOW, MAGAZINE & BLOG. Travel to exotic golf destinations in Thailand, Brazil, Iceland, Switzerland, Ireland, Scotland, France, The Caribbean, Costa Rica and beyond! "Golfin' Around" is fun! "Golfin' Around" is hosted by comedian and award winning writer and TV host, Randy Tantlinger! "Golfin' Around" has been honored to interview the games legends over the years! 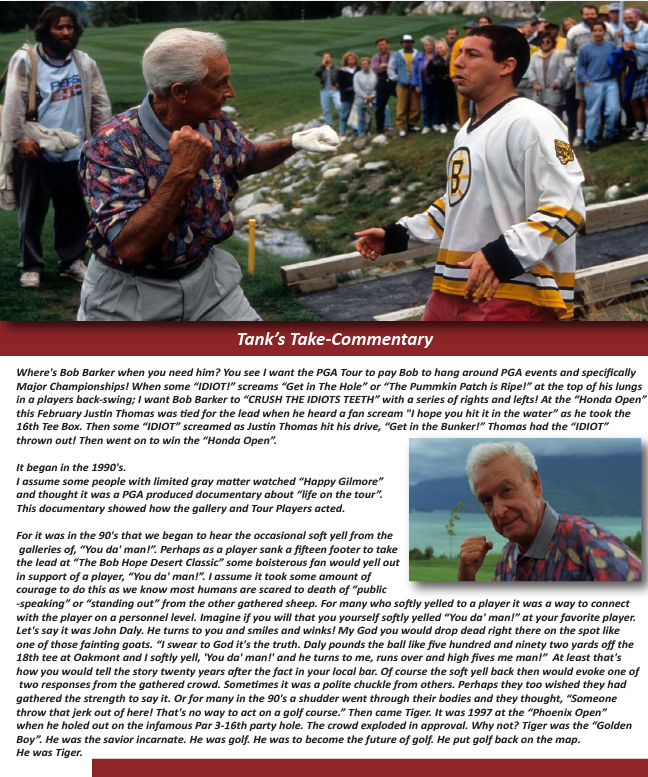 Interviews with golfs greats; Nicklaus, Palmer, Player, Watson, Daly, Johnson and more! The "Golfin' Around TV Show" is proud to be awarded the "TELLY AWARD" for our episode featuring St. Andrews, Scotland! Golfin' Around is broadcast on "COX SPORTS TV"
Reaching into 19 states, “COX SPORTS TELEVISION” is regional sports at it's best! Arizona, Arkansas, California, Connecticut, Florida, Georgia, Idaho, Iowa, Kansas, Louisiana, Massachusetts, Missouri, Nebraska, Nevada, North Carolina, Ohio, Oklahoma, Rhode Island, Virginia! 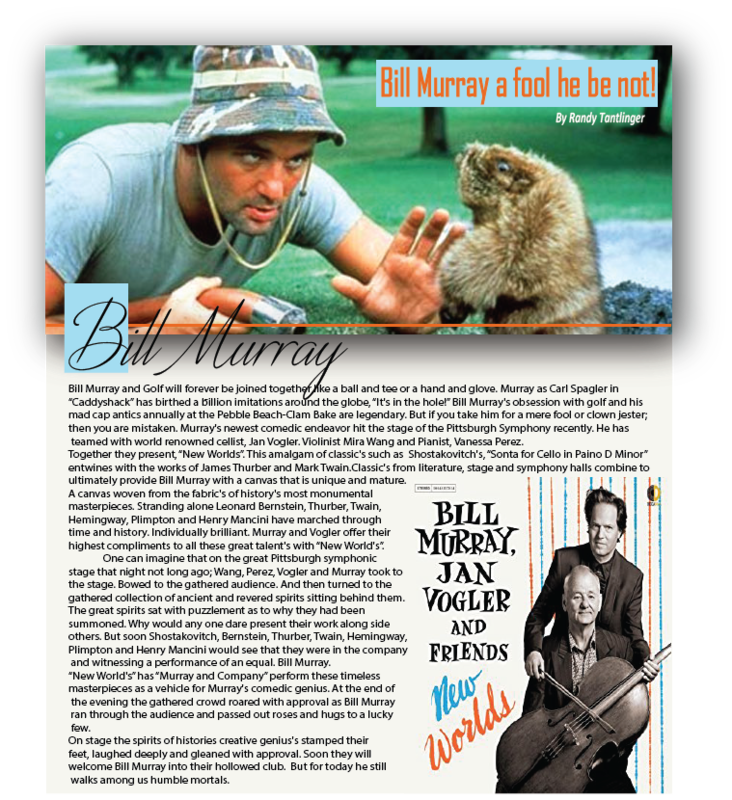 Click on links below to listen to our Radio Show & Read our 2018 Magazine! ​Celebrating Gary Players 80th birthday! 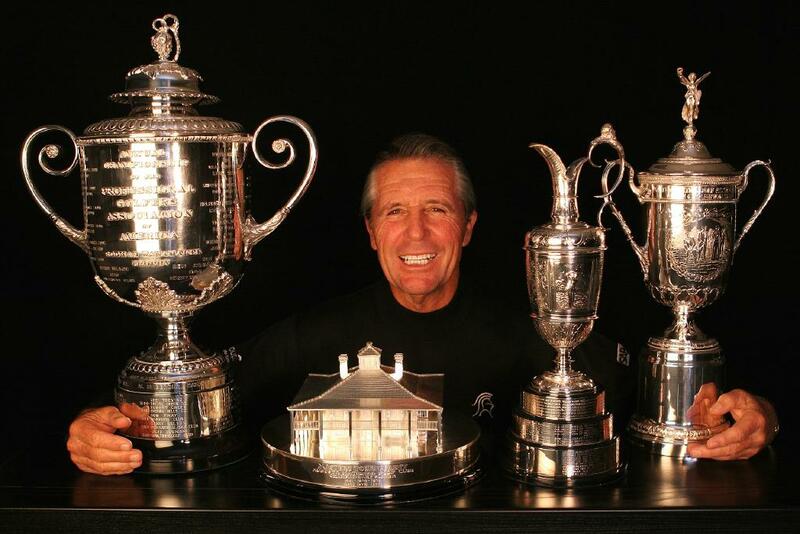 Gary Player, on the occasion of Mr. Players 80th birthday. RT: First off Happy 80th birthday Mr. Player! Thank you for your time! It's an honor Sir. Mr. Player as you celebrate your 80th birthday and reflect back on your life; what single event or person shaped your moral and mental constitution as a person? And what value or mantra do you have that helps you succeed? GP: The ability to overcome adversity is what gave me strength. So, it’s unfair to point out just one instance because I faced hard times throughout my life. My mother died when I was only eight-years-old, I had to accept it and move on. When my brother left for war and made me promise to work out, I stayed true to that promise even though the only person pushing me was myself. I had to sleep on the beach the night before my first British Open Championship, but it was just part of my journey to become a World Champion. As for a mantra, I have always maintained that the harder you practice, the luckier you get. RT: You are well known for your incredible physical fitness routine? Have you ever wrestled an alligator? GP: (Laughs) No yet, but that might be something I can start training for! RT: You are one of a few players in the history of our great game to win the “career Grand Slam”. Which of those victories in your Grand Slam was the most difficult to win? GP: I am very proud to have achieved two career Grand Slams, one on the Regular tour and one on the Senior Tour. The next Major is always the hardest to win. I was 29 and had the lead at the 1965 U.S. Open, but didn’t make it easy on myself. With three holes to play and up by three shots, I thought the Grand Slam was mine. But in golf anything can happen. I wasn’t patient enough and the lead vanished. I had to win the tournament in an 18-hole playoff against the Australian Kel Nagle. I don’t think I played in another tournament when there was so much pressure to win given the significance. RT: I love your logo and nick name. How’d you get the nick name “The Black Knight? GP: Growing up, I was a big fan of the Western genre of TV shows. One of my favorites was Jack Paladin, Have Gun - Will Travel. He wore all black. He was a good man and helped others. My father had convinced me I needed to create a style and a logo if I was going to build an identity, so I chose The Black Knight because it fit my demeanor. Perhaps subconsciously, I chose black to represent the people of Africa whom I have always tried to help. RT: You are without question one of the greatest players to have ever played the game. What would you like your legacy to be? GP: Golf has brought so many blessing to my life. I was able to travel all over the world and provide a good life for my family. I dined with world leaders and with local tribesmen in the African bush. But my goal is not to be remembered as only a professional golfer. I am still very active and want to make a difference in the lives of people. We are doing this through The Player Foundation and have set a goal to raise $100 million for children by 2020. When we accomplish this goal, I hope that helping people will be the biggest part of my legacy. We call it "Golf and Giving." RT: What do you think off all the “screaming and yelling” these days that comes from the Galleries directed towards players? GP: I really don't like it at unless it is positive applause for a great shot. I hate the idiots that yell out "you da man" for no reason at all. As long as the player about to hit the ball is the one instigating the noise, and it doesn’t distract the other golfers who are playing on a different hole, then I'm all for vigorous applause. RT: South Africa’s incredible story of evolution from abandoning the Apartheid system to a modern country is remarkable. It is amazing to me that in those twenty short years that the people have come so far along in their emotional maturity. They openly discuss the travesties and mistakes of the past. They openly talk about race relations and struggles of economics. It is simply amazing to me that in such a short time, twenty years, that all races of people are now moving together in unity. What does South Africa’s evolution and progress as a society say about mankind’s ability to solve conflicts amongst people of different religions, races and backgrounds? GP: We certainly have come a long way in a short amount of time. Love is the most important part of any society. When you figure out how to love one another, forgive one another, respect one another, great things can happen. What has happened in South Africa is an example the world should never forget.